This was a fairly large backyard creation job. When first viewing the property and examining the site, we saw many opportunities to improve the usefulness of the backyard space. There was no room for activities with no level areas. Everything was sloping downhill, including the old Rail Road ties holding back the dirt for the walls. The wood was beginning to rot and this yard needed some major help to become what a lake house back yard should look like. We wanted to transform the yard with multi level use. Having a North beach, South Beach, a place to store the boat lift and docks, followed by a large fire pit area. After some measurements were noted, ideas started flowing, a sitemap was drawn, agreements were signed, and the project was underway. The work was completed in 3 steps to insure that the customer was 100% satisfied. 1st step was the excavation of the 120+ yards of dirt that would need to be removed along with the wooden railroad ties. 1 large pine tree was also removed. 2nd step was installing all the retaining walls and proper crushed gravel for proper drainage. It is important to make sure the yard will drain properly now that the land has been disturbed. To ensure proper drainage, 1.5’ of crushed gravel was added at the base of the new boulder retaining walls. Then the walls are constructed from the bottom up starting at the lowest levels first. Biggest boulders are placed first for firm foundation and used for other recreation ideas. Starting at the North beach and building to the south, ending at the south beach. 3rd step was to complete the detail work such as the granite floor, concrete pillars, steps, adding top soil and final touches. Between each beach will be a landing area to place items such as coolers, picnic tables, gear, wake boards and other water activity supplies. During the Winter months this area can be used for storing the boat lift, jet ski lift, and the entire dock making the land much more useful. Following the boulder retaining wall installation comes the concrete block wall, installing the steps starting from the bottom working upward. Next we haul in the granite floor slabs and cut to shape when necessary to make a nice tight fit. There are other small miscellaneous such as adding Gator Dust made by Alliance in all the patio floor cracks. Finally after the retaining walls are set, steps are installed, patio area and pavers have the proper material and are level, with all the previous steps are completed, the final stage is to fully complete the Fire Pit Patio area, add two pillars for plants, leveling off the land, adding topsoil, followed by some straw to hold to moisture for grass to grow. A customer can choose from several different options of block sizes, shapes, colors, and textures. Here are several of the choices to choose along with many more not pictured. The floor here is a granite type rock that is cut into large slabs and is very heavy to handle but is very sturdy and will last forever. Often times we use basic patio blocks all of which the customer can decide which route to go. It is key to remember what materials go under the patio floor. Making sure the patio drains properly and securing the pavers from any movement can be prevented by adding the proper amount of limestone followed by a final layer of sand. This project too approximately one month and was completed in the fall of 2017. In all, the property was very old and outdated. It needed a face lift just like we gave it. In the beginning, there was only 2 areas to recreate which was around a old fire pit and a lower patio that was about to cave in. We transformed the property to now have 5 or 6 areas for people to hangout and recreate. A small garden was even added on the side. No longer with guests be tipping over in their chairs because of the hill incline. It was incredible to have been able to be part of a project like this and have several others lined up for 2018 already. 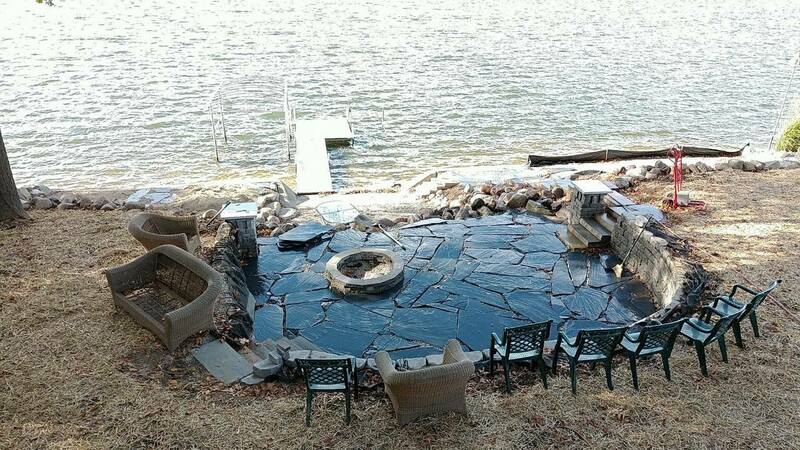 Cottage Care Co. is a property management company providing Southwestern Michigan with landscape design, seawall and retaining walls, small excavation, patio installation, lawn care & more services. 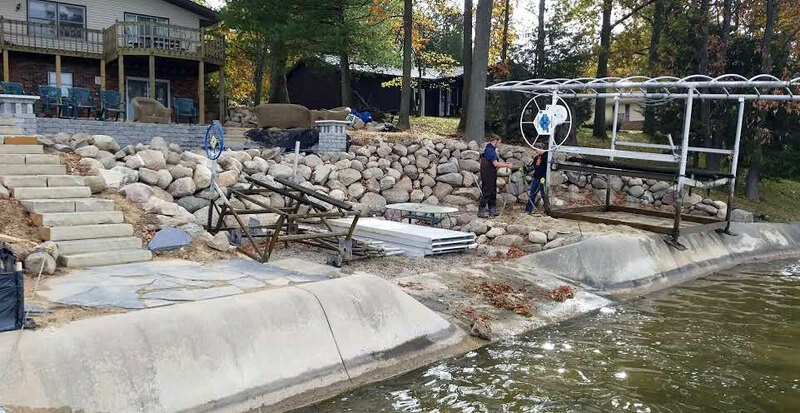 This project was completed on Lake Templene in St. Joseph Co. MI in 2017.